During the first half of March, two major war exercises are underway – one in the Mediterranean off the coast of Sicily, the other in Israel – both led and supported by USA/NATO commands and bases in Italy. At the Dynamic Manta 2018 – a submarine war exercise, supported by the Sigonella and Augusta bases and the port of Catania in Sicily – naval forces from the United States, Canada, Italy, France, Belgium, Germany, Great Britain, Spain, Greece and Turkey participate with 5,000 men, surface ships, sub-marines, airplanes and helicopters. The exercise is led by the NATO Command headquartered in Lago Patria (JFC Naples), under the command of US Admiral James Foggo. Appointed by the Pentagon as his predecessors, at the same time he commands the U.S. Naval Forces Europe and U.S. Naval Forces Africa, whose headquarters are in Naples Capodichino. The purpose of the Dynamic Manta 2018 is explained by Admiral Foggo: the United States is fighting the “Fourth Battle of the Atlantic”, after those of the two World Wars and the Cold War. It is fought against “increasingly sophisticated Russian submarines that threaten the sea lines of communication between the United States and Europe”. The Admiral accuses Russia of conducting “an increasingly aggressive military activity”, citing as an example the Russian fighters flying over US ships. However, he does not say that these warships operate in the Baltic and Black Sea near the Russian territory. At the same time the US Global Hawk drones, taking off from Sigonella, fly two or three times a week along the Russian coasts on the Black Sea. Wearing the NATO captain’s hat, Admiral Foggo prepares Allied naval forces in Italy against Russia. Wearing the US captain’s hat, he sends the Sixth Fleet from Italy to Juniper Cobra 2018, a US-Israeli joint operation mainly directed against Iran. From the base of Gaeta, Mount Whitney, the flagship of the Sixth Fleet, arrived in Haifa, accompanied by the amphibious assault ship Iwo Jima. The Mount Whitney is a floating headquarters, connected to the global command and control network of the Pentagon also through the MUOS station of Niscemi. 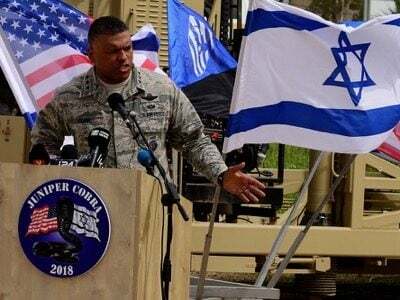 The Juniper Cobra 2018 – which involves 2,500 US soldiers and as many Israelis – began on March 4, while Premier Netanyahu, meeting with President Trump, claimed that Iran “has not renounced its nuclear ambitions” (not saying it is Israel the only nuclear power in the Middle East) and concluded “Iran must be stopped, this is our common job”. The exercise simulates the Israeli response to the simultaneous launch of missiles from Lebanon, Iran, Syria and Gaza. The real scenario may instead be that of a missile launch falsely attributed to the Lebanese Hezbollah allied with Iran, as a pretext to attack Lebanon by targeting Iran. Just 72 hours later – US and Israeli officials declare – US forces would arrive from Europe (in particular from bases in Italy) to join the Israeli forces in the war. The presence at Juniper Cobra of General Scaparrotti, head of the European Command of the United States, confirms this plan, which he defined at a meeting with the Israeli general staff on 11 March. Since Scaparrotti is also the Supreme Allied Commander in Europe (a position that always belongs to a US general), the plan foresees a NATO participation, above all Italian, to support Israel in a large-scale war in the Middle East. Manlio Dinucci is a geographer and geopolitical scientist. His latest books are Laboratorio di geografia, Zanichelli 2014 ; Diario di viaggio, Zanichelli 2017 ; L’arte della guerra / Annali della strategia Usa/Nato 1990-2016, Zambon 2016.